Whether you've changed jobs, retired, or your 401(k) plan has been terminated, you now have decisions to make that require careful consideration. Rollover Center is designed to explain the options available to you for your retirement plan distribution. You will also discover how a direct rollover to a Self-Directed IRA offers you an attractive way to continue building your retirement nest egg on a tax-deferred basis. 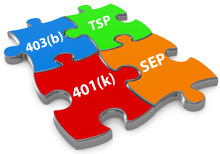 We recommend you take a minute to order a 401(k) Rollover Kit. A Rollover Kit includes several helpful retirement planning publications, including "Your Retirement Plan Distribution: How Your Decisions Today Affect Your Future." How Do I Start a Rollover? Securities offered through Century Securities Associates, Inc. Member SIPC & FINRA A subsidiary of Stifel Financial Corp. Investing involves risk including the possible loss of principal invested. Decisions to roll over or transfer retirement plan or IRA assets should be made with careful consideration of the advantages and disadvantages, including investment options and services, fees and expenses, withdrawal options, required minimum distributions, tax treatment, and your unique financial needs and retirement planning. Century Securities does not offer tax advice. You should consult with your tax advisor regarding your particular situation as it pertains to tax matters.